From Right: National Public Relations Officer, Save Nigeria Freight Forwarders Importers Exporters Coalition (SNFFIEC), Comrade Kingsley Nwankwo, National Treasure Of The Group, Comrade Reuben Onyejike, Coordinator Of The Group, Sir Osita Chukwu Patrick, Secretary General, Comrade Vincent Onuoha and Comrade Gerald Iroehika at Media Chat With members of MARCON Thursday.. Following the recent implementation of the federal government’s new automobile policy on used vehicles by the Nigeria Customs Service (NCS) on Wednesday, a group, Save Nigeria Freight Forwarders, Importers and Exporters Coalition (SNIFFIEC) has called on the Federal Government to revert to status quo on the automobile policy saying that the policy is unacceptable to members of the public. 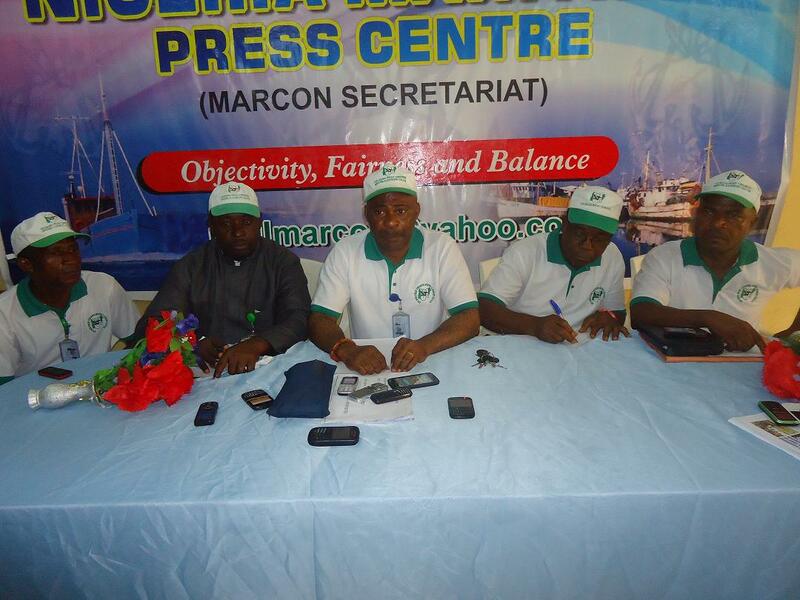 The group also gave the Maritime Advocacy and Action Group (MAAG)’s Coordinator, Alhaji Al-Hassan Dantata a 72 hours Ultimatum to address the members of the twelve maritime associations that made MAAG on the way forward on the new automobile policy of the federal government as being championed by the NCS. Addressing journalists under the aegis of Maritime Reporters Correspondents’ Organization of Nigeria (MARCON), at the Nigerian Maritime Press Centre in Lagos, Thursday, the National Coordinator of the group, Chief Sir Osita Patrick Chukwu reiterated that the country was not yet ripe for such policy to be effected even as he urged the Nigerian Customs Service not to bring the policy to public notice. According to him, the input of the Coordinator of MAAG on the policy needed to be known by other constituent associations adding that on the expiration of the 72 hours Ultimatum and there was no reaction from the MAAG boss, his group will have no option than to take the option of shutting down the ports. “In as much as the power conferred on me as the Coordinator of the SNFFIEC is concerned, our stand remains that the federal government should go back to status quo and if nothing happened, we will be waiting for MAAG to make input before shutting down the ports”. “As a group in MAAG, we cannot stay here and look at our country and the masses suffer, we are now telling the Coordinator of MAAG that if in a couple of days we did not hear from him, we will have no option to create an unfriendly environment in the ports”, he warned. He maintained that there is the need for government to discuss issues with maritime stakeholders for the betterment of the economy and the nation in generality before coming up to lay such policy in the public domain even as he wondered why the government would take stakeholders into confidence in other sectors only to do that with impunity in the maritime sector. The coordinator explained that the payment of duty on vehicles has become a major challenge in port operations and the banking sector has also made things worse for practitioners. He noted that the group has rejected to comply with the circular signed by the Deputy Comptroller general of customs on tariff and trade on behalf of the comptroller general on the automotive policy. Osita expressed dismay on government policies which he described as having inflicted pain on the masses. He added that the policy will ground the economy of the nation as most freight forwarders, importers and exporters will have to surrender their respective businesses at the detriment of this inhuman policy if allowed to stand as the automobile sector provides job for people. Osita stressed that a large number of freight agents operating from the sector are into automobile clearance from the port and the policy will send most of them out of the respective jobs. Meanwhile, freight forwarding associations Thursday staged a peaceful demonstration at the Tincan Island ports expressing their anger over the implementation of the new automotive policy of the federal government by the Nigeria Customs Service calling on the federal government to rescind its decision on the matter. The protesters observed that it was wrong for the customs to embark on enforcing the new policy when consultations were on to get the federal government to revisit the matter describing the implementation as hasty and injurious to the economy. The Nigeria Customs Service had through a circular issued by the Deputy Comptroller General of Customs, Aliu G.T on the 28th, February 2014, and directed all the Deputy Comptrollers Generals, all Assistant Comptroller Generals, all Zonal Coordinators, all Customs Area Controllers and all Unit Heads to convey the Fiscal Policy Measures for the automotive industry. The circular with the circular number 004/2014 with the titled,”Re: Fiscal Policy Measures for the Automotive Industry”, read in part,” I am directed to forward herewith copy of the federal Ministry of Finance letter Ref. No. BD/FP/DO/09/1/189 dated 14th November, 2013 conveying Fiscal Measures for the automotive industry. You are to ensure widest circulation and strict compliance please”. Under the new policy, Fully Built Unit (FBU) cars falling under H.S Code 87.03 shall attract a duty of 35% and 35% levy, Fully Built Unit (FBU) Commercial Vehicles falling under H.S Code 87.01, 87.02, 87.05, 87.06, 87.07, 87.16 shall attract 35% duty without levy. Also, Local Assembly plants shall import their Complete Knocked Down (CKD) at zero percent, Semi Knocked Down ones (SKD) H.S Code 87.06 at 5% duty while Local Assembly Plants shall import Fully built Cars at 35% duty for Commercial Vehicles without levy respectively in numbers equal to twice their imported CKD/SKD Kits.